Not sure whether order is correct and list is complete. Hope s.o. recorded the gig (not only for getting a complete tracklist). Awesome gig. Von has been in a good mood, Adam and Chris were brilliant as ever. Sound could have been better at the beginning, some rain during the set but who cares. Too bad they did not play Emma. However, you can't get everything. Security was annoying. As soon as I was sitting of the shoulders of my buddy Steffen they were trying to pull me down. The audience could have been a bit more enthusiastic either (well, g***s you know...). However, I had a great time. Wasn't there, and already veering off topic, but did anyone see Qntal or Deine Lakaien? Both on the same bill, and both bands I'm very fond of. Would have loved to have gone but had to work. Thoughts appreciated. Ta! I did not see the complete Deine Lakaien. Average gig (on a high level though) but it was for sure not as good as their free gig on Friday at Hannovers "Capitol". Absolutely stunning pics again, thank you! That lightshow is out of this world. The Sisters set was one of the shortest I've ever seen. Crowd were lousy, all too busy trying not to mess up there hair. And to top it all when it rained up went the umbrellas!! Sisters on at 8.50 and all over by 10pm give or take a minute!!!! A slight anti-climax to a great set of gigs. ah, the last gig of the tour! bottom line: You can't always make it if you try or, I went to Hildesheim to miss the Sisters. Yes... I have to agree with you. Wasn't to bad but after seen Tilburg and Lokeren, my expectations were high. 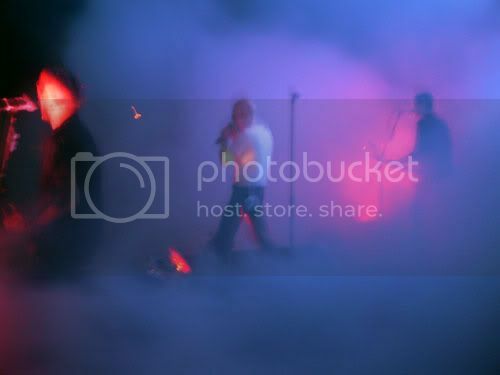 But with alot of smoke, not so powerful sound and half of the gig umbrellas in my face and no Emma, I Was Wrong or Neverland it ended a bit as an anti-climax. But hey, I'm a spoiled Sisters fans. This was my 24st gig since Dour 97 So what am I complaining about? A bit of rain? A shorter setlist because they had to stop at 10 pm? Nah it was a good gig and a good tour. Sorry, that the pics aren't any better. I had a pretty good view although I was mostly surrounded by the smoke. Chris, while getting his strings changed. Maybe Ania got some better ones. sorry bro, lets hope you get another chanse sometime fast. but what about Ania´s Pictures? 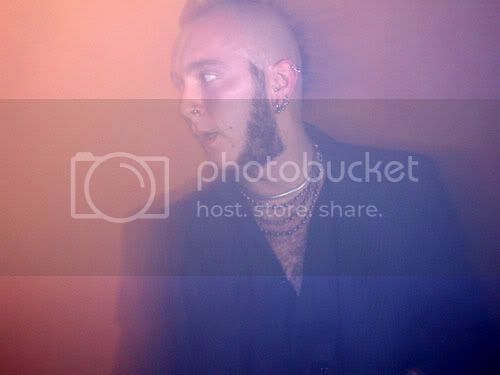 My photos are now online at http://www.wiscel.com (pics from the other bands at M'era Luna will follow later this week. no. ania's username is "delilah". I may write a more proper review later and post it on tours.tsom.org. But I have to say that the gig was great, one of top 3 I've seen. Shame it was so short though.. and those goths.. can't they at least clap the hands when the songs are over? I was wondering many times why they even bothered standing at the fourth row at all.. they just looked bored! Anyway, the sound was bad at the beginning but turned out to be great at the middle of the set. Lucretia was the highlight, it actually sound better than the original, and Chris looks very good on stage! Some pics is on it's way... and some videoclips. saw The Sisters from "behind", and I did really enjoy it! Apart from that, the weather was c**p, we ended up spending most of the day at bands catering area, sitting on the fridges full of Becks and not being able to drink any... After the gig we spoke briefly to Von, Chris and Adam, Von was trying to disguise himself ( 2 hoodies and glasses, quite funny really coz it was really unnecessary, nobody there was really paying any attention). Chris told us he needed to be at work on Tuesday and didn't like the idea of it , Adam came round after with a... signed setlist and gave it to ma saying - I found it on the floor I wasn't sure what I should do with it, frame it perhaps? If somebody lost it there, PM me, I still have it! There was no aftershow party coz band was heading back to Calais after the gig, and the other bands left to their hotel bars after the gig, so Jess ended up driving back to Berlin and I had 4 hours to kill in very boring Hildesheim waiting for my train to Hanover. One more funny thing - after crossing the Chanel and going through customs I was one of the few people stopped and having my bags checked and the guy asked me where I was coming back from. I said that from Meraluna Festival, he asked me about the bands that were playing there, I said TSOM and he said something like "but they are back in England now, I have searched them few hours ago". I wonder why the next question he asked was if I had any DRUGS or explosives on me Pics - similar quality as Jess's, have lots of pics of smoke, haha! I don't think it was the last Sisters gig though.